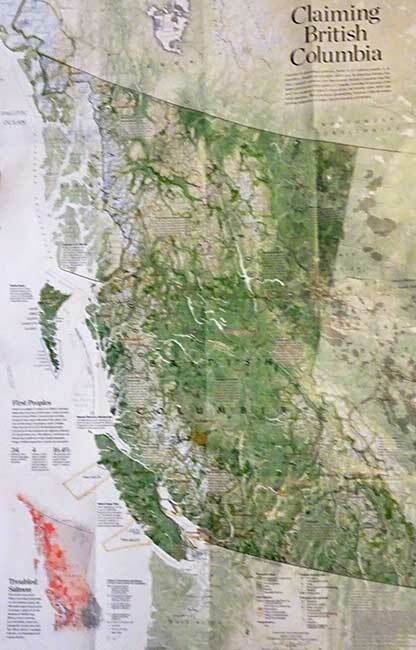 The map has three themes: First Nations’ traditional territory, the routes of proposed pipeline projects, both LNG and diluted bitumen, and it features a sub map that looks at what the map calls the “Troubled Salmon” fishery. 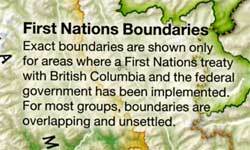 The cartographers at National Geographic are being very careful, avoiding such troubling issues as competing land claims among First Nations, unresolved land claims with the federal and provincial governments and treaty status. 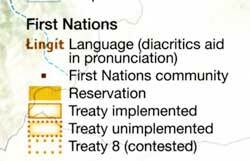 So by and large the map groups First Nations by language group unless there are definite treaty or reserve boundaries. 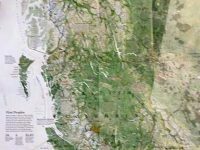 Large reserves under the Indian Act are on the map, but given the post stamp size of many reserves in British Columbia, those reserves are too small to be seen on the map. 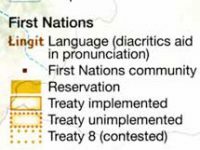 Towns and cities are identified as “First Nations” communities which often overlap with settler communities. Again the map misses many smaller communities, so Kitimat is on the map, while Kitamaat Village is not. 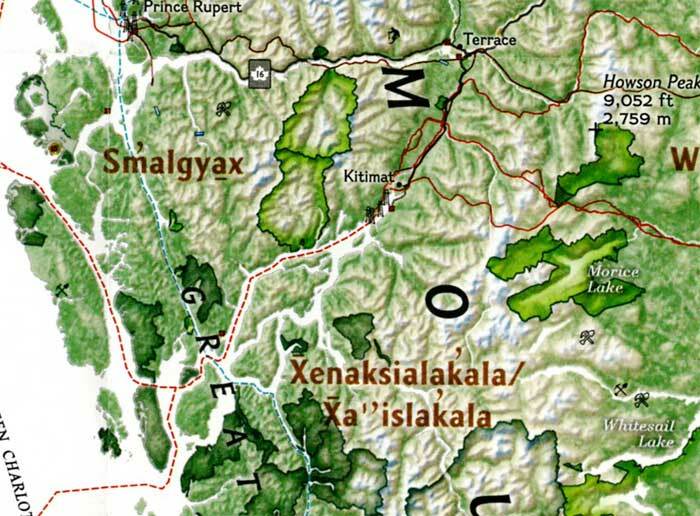 The map identifies Haisla traditional territory as “Xenaksilakala/Xa”islakala” and also includes the Kitlope Heritage Conservancy Protected area. The article in the September issue is called The Pacific Coast, but unfortunately there is not much of a tie-in with the map, since it concentrates on California and Alaska with only a passing mention of British Columbia. On the obverse side of the map is the poster that is promoted on the magazine cover, a beautiful painting of “The Changing Pacific Coast” which covers kelp and every creature from phytoplankton and zooplankton all the way to humpback whales and sea gulls (but for some reason no bald eagles). It is likely that poster will be on display in classrooms up and down the coast before school opens next week. A new study, based at the University of Alberta, released this week, indicates that natural selection may be making the mountain pine beetle more tolerant of colder temperatures and that the beetle may be evolving the ability to fly longer distances. A second study, from the Colorado School of Mines, also released this week, is tracking how the extent of pine beetle infected or killed trees in forests is changing ground water and stream flows. The mountain pine beetle infestation has wreaked havoc in North America, across forests from the American Southwest to British Columbia and Alberta. Millions of hectares of forest have been lost, with severe economic and ecological impacts from a beetle outbreak ten times larger than previous ones. Dust from beetle killed wood is believed partially responsible for the explosions at the Lakeland Mill in Prince George and the Babine Forest Products mill in Burns Lake. The explosion in early 2012 at the Babine Forest Products mill killed two workers and injured another twenty. The Lakeland Mill explosion killed two workers and injured twenty four others. As part of the fight to contain the mountain pine beetle, scientists recently sequenced the pine beetle genome. Using that genome, Jasmine Janes and colleagues at the University of Alberta, with assistance from the University of British Columbia and the University of Northern British Columbia, used genetics to track how the pine beetle was able to expand its range so rapidly. The study was published in Molecular Biology and Evolution. While teams of researchers have tracked the path of the pine beetle across BC on the ground, how the beetle spread so easily “is only beginning to be understood at the molecular level,” the study says. Pine beetles were collected from 27 sites in Alberta and British Columbia. The University of Alberta scientists were especially interested in how the pine beetle was able to jump across the Rockies, something that earlier researchers believed would not happen. By looking at the genetic markers, the team concluded that the pine beetle may have been able to spread by adjusting its cellular and metabolic functions to better withstand cooler climates and facilitate a larger geographic dispersal area. In an e-mail to Northwest Coast Energy News, Janes said the research looked at genomic signatures to find out how the beetle had been able to spread into Alberta – where did it come from, what route did it take and how did it overcome the physical and climatic barriers that we had always assumed? It is generally believed that climate change has help the pine beetle survive milder winters. Successful establishment of mountain pine beetle on pure jack pine in northern Alberta has raised concerns that the mountain pine beetle will continue to expand its range into the vast boreal forest of jack pine that extends across North America from the Northwest Territories to the Atlantic Coast. The second part of the research was answering the question of how the beetles were able to do this. How could they withstand the colder temperatures to spread further north and east? The study looked at specific functions in the beetle: the genes that govern “actin filaments” that “control muscle contractions like shivering and moving wings”; “the synthesis of cholesterol that provides energy for metabolic activities” and transport of ions across cell membranes. Normally, female pine beetles can only fly short distances to find a new host tree to lay eggs. They can travel longer distances if they are up in the tree canopy and are then carried by the wind. Stronger pine beetles that can fly longer distances show the threat is likely evolving. may continue as populations are currently exhibiting signals of selection. These signals suggest ongoing adaptation of metabolic and cellular processes that could potentially allow them to withstand colder temperatures, shift developmental timing and facilitate longer dispersal flights. The Colorado study asked how all those dead trees are changing stream flow and water quality? “The unprecedented tree deaths caused by these beetles provided a new approach to estimating the interaction of trees with the water cycle in mountain headwaters like those of the Colorado and Platte Rivers,” said Reed Maxwell a hydrologist at the Colorado School of Mines. Maxwell and colleagues have published results of their study of beetle effects on stream flows in this week’s issue of the journal Nature Climate Change. As the trees die, they stop taking up water from the soil, known as transpiration. Transpiration is the process of water movement through a plant and its evaporation from leaves, stems and flowers. The “unused” water then becomes part of the local groundwater and leads to increased water flows in nearby streams. “Large-scale tree death due to pine beetles has many negative effects,” says Tom Torgersen of the US National Science Foundation’s Directorate for Geosciences and program director for the NSF’s Water, Sustainability and Climate program. “This loss of trees increases groundwater flow and water availability, seemingly a positive,” Torgersen says. Under normal circumstances, green trees use shallow groundwater in late summer for transpiration. Red- and gray-phase trees–those affected by beetle infestations–stop transpiring, leading to higher water tables and greater water availability for groundwater flow to streams. 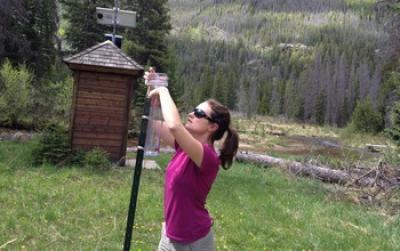 The Colorado study shows that the fraction of late-summer groundwater flows from affected watersheds is about 30 per cent higher after beetles have infested an area, compared with watersheds with less severe beetle attacks. “Water budget analysis confirms that transpiration loss resulting from beetle kill can account for the increase in groundwater contributions to streams,” write Maxwell and scientists Lindsay Bearup and John McCray of the Colorado School of Mines, and David Clow of the U.S. Geological Survey, in their paper. “Using ‘fingerprints’ of different water sources, defined by the sources’ water chemistry, we found that a higher fraction of late-summer stream flow in affected watersheds comes from groundwater rather than surface flows,” says Bearup. An important implication of the research, Bearup says, is that the change can alter water quality. Where were those water treatment plants located? In bark beetle-infested watersheds. The TRIA project (a collaboration of researchers at the University of Alberta, University of British Columbia, University of Montreal, University of Northern British Columbia). The TRIA project investigates the physiology, genetics and ecology of all three players in the mountain pine beetle system – the pines (lodgepole and jack pine, and their hybrids), the beetle and the fungus (several types). The Colorado study is funded by the National Science Foundation’s (NSF) Water, Sustainability and Climate (WSC) Program. WSC is part of NSF’s Science, Engineering and Education for Sustainability initiative.